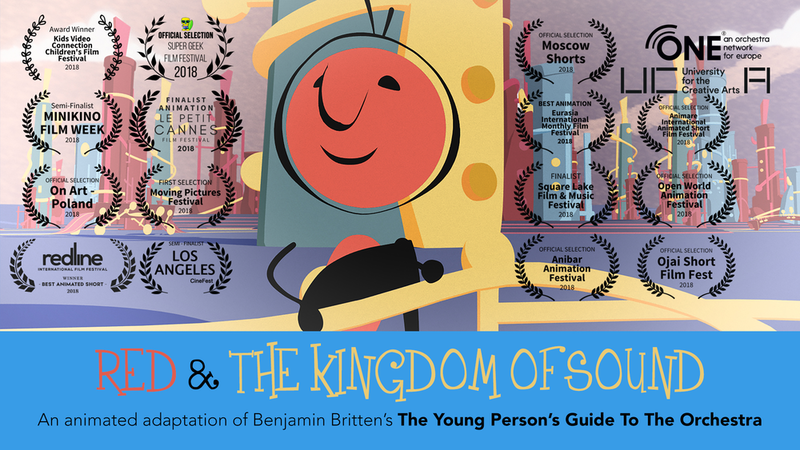 Red & The Kingdom Of Sound is an animated adaptation of Benjamin Britten's 1945 composition, The Young Person's Guide To The Orchestra, produced by the students, staff and alumni of Computer Animation Arts. The animation was devised to be screened with live accompaniment by symphony orchestras and was commissioned as part of the ONE is more project. The ‘ONE is more’ project, funded by Creative Europe, aims to develop partnerships across boundaries internationally and culturally. "Red & the Kingdom of Sound is a short animated film that follows a note (Red) as he enters and explores a world of music. Using a composition by Benjamin Britten, writer/director Phil Gomm creates a vibrant and playful world that honours classical music and the feelings that it conveys. For the uninitiated, classical music can feel out of reach. It has a bourgeoisie quality to it and a preconceived notion of the genre of being a type of entertainment only for the very rich. But with the use of clever animation and charming storytelling, Gomm highlights the beauty of classical music and how accessible and universal it can be. Animated films are always fun. They blend artistry with whimsy, combining storytelling, filmmaking and art to create a unique portrait and this short is no exception. The combination of sweet animation with the impressive score creates an engaging work that allows the viewer to be swept into the world of the film. Almost immediately, this short film reminded me of Walt Disney’s Fantasia in how it combines classical music and animation to present the amazing scores in a unique and engaging way. Like the Disney film, Red & the Kingdom of Sound uses art to introduce the viewer to classical music through a series of images and a visual story that enhances the music. The entire film is really reflective of the journey that notes take as a piece of music is played. The tale that the film tells is of Red’s journey through Britten’s composition “The Young Person’s Guide to the Orchestra”. Different parts of the symphony are reflected by a unique district that encapsulates the themes, mood, and feeling of that particular piece within the composition. For example, the oboe district is appropriately underwater while the flute section is reflected in a light and airy area of the kingdom. For the harp section, the world looks like heaven (if heaven were comprised solely of harps) and more intense aspects of the score are reflected by dominating figures of royalty and harsh skyscrapers. The world created by Gomm’s animation also represents the different phases that classical music goes through as it’s being played - throughout the film, the environment can resemble a sheet of music or an orchestra seating arrangement in a theatre and finally, how all the notes come together to give shape and imagination to a piece of music. The animation is adorable and all the characters are crafted by using the look and shape of musical notes as a base. It’s the little things like this that make this animated short film stand out – the care and the craft that it takes to ensure that a theme is represented all the way through a film shouldn’t be ignored and Gomm’s attention to detail is impressive. You don’t need to be a child to enjoy this charming piece. It’s fun and whimsical, so it’s hard not to enjoy the film and be taken in by the beauty of the score and how the animation reflects so easily what it feels like to listen to and imagine the world of music as it plays."